January 6 – 12 is Folic Acid Awareness Week, but folic acid should be part of a healthy lifestyle every day. You can start the New Year off right by taking a multivitamin with the B-vitamin, folic acid, every day. Think you are getting all of the vitamins you need from your diet alone? Think again! It is hard to get certain vitamins from food alone. · Many believe they do not need to take multivitamins because they eat healthy foods. Folate, a different form of the same B vitamin, is found in foods such as leafy green vegetables, beans, liver and some fruit, but 50 to 90 percent of food folate is destroyed in cooking. 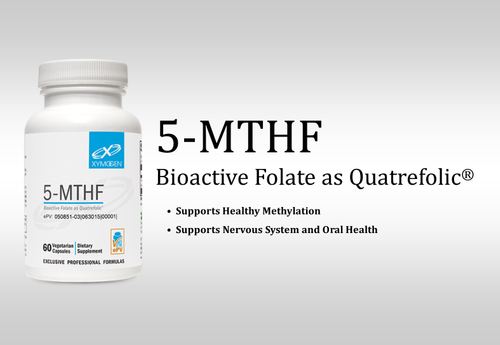 · 5-MTHF, is the most biologically active form of the water-soluble B vitamin, folic acid. It is the preferred form of folate supplementation due to an array of conditions that can limit conversion or absorption of folic acid. 5-MTHF is found in pharmaceutical grade multivitamins. · Multivitamins help fill in those nutrition gaps in the diet, especially when it comes to getting enough folic acid. · Folic acid is an essential B-vitamin; therefore, everyone needs it in order to stay in good health. Folic acid helps build DNA and your body uses it for cell growth and reproduction, fundamental building block processing and genetic material production. · Possible problems or symptoms you may experience if you are not getting enough folate are anemia, trouble with your immune function, fatigue, insomnia, or cardiovascular disease. · In 1998, the U.S. Food and Drug Administration started fortifying cereal grain products with folic acid in order to reduce the risk for neural tube defects (NTDs), serious birth defects of the brain and spine. While this was a great step in the fight to prevent birth defects, it is often not enough to protect all women and their potential children. · Folic acid is water soluble, therefore it passes through your body very quickly. Taking folic acid every day ensures that you always have it in your system when your body needs it. · It is particularly important for women of reproductive age to get a minimum of 400 mcg of folic acid daily. It has been shown to reduce the risk of having an NTD by up to 70 percent. Since about 50 percent of pregnancies in the United States are unplanned, it’s important to take folic acid every day, even if you’re not planning to get pregnant. The most common NTDs are spina bifida and anencephaly. · Many people may need more due to common genetic MTHFR mutations. Annie's Apothecary works to educate consumers and health care providers about the benefits and sources of folic acid. We recommend getting a minimum of 400 mcg of folic acid daily by taking a multivitamin with 5-MTHF and eating a diet rich in folate. People who are interested in joining the effort should tell their friends and families about folic acid. Remember to make folic acid part of your healthy lifestyle! You may buy 5-MTHF or a pharmaceutical grade multivitamin containing folic acid at Annie's Apothecary.